The Return of the King of the Hill! Details - This is a tournament variation we designed ourselves over a decade ago and called King of the Hill. We know you'll enjoy it! Spread the word and join in on the fun! If a crowned player knocks out another crowned player, the losing players crown is removed from the tournament. If an uncrowned player knocks out a crowned player, they get the crown and therefore have another "life" re-entry should they get knocked out again. The winners are the Top 10% of players with crowns removed from the tournament (by being knocked out by remaining crowned players, and the overall winner (last crowned player remaining) will be crowned "King of the Hill"! There will be Cash Tables and Gold Rush Flips available, so this is definitely an event not to miss! To be eligible for a Crown re-entry, when getting knocked out you MUST immediately raise your hand with the Crown and call over a staff member. If you try to hold off for the next blind change or any other delaying tactic, you will be disqualified from the tournament. Unless altered above, all WAPL Pro League Rules apply to this tournament. 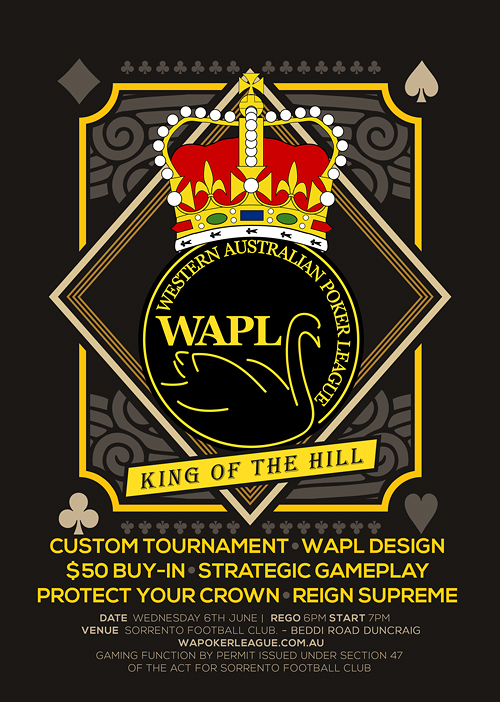 We look forward to seeing you at the King of the Hill event, and anticipate another great night of poker! Have you been with us long enough to remember this?